Featuring the Long Range Focusing Optic System the HP314 has Coast's longest, X-Range Spot Beam and their most powerful, Broad View Flood Beam. 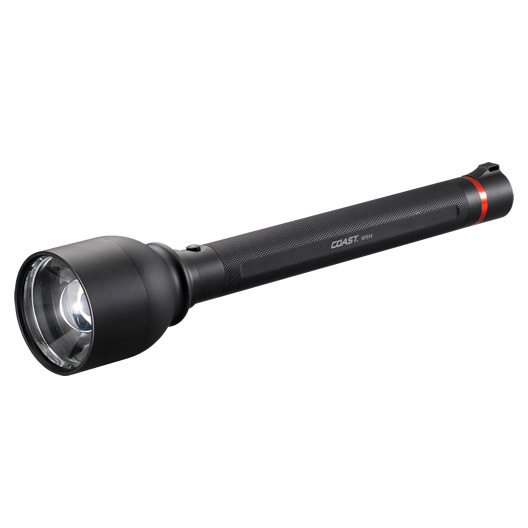 With a beam distance of 2,240 feet; this flashlight is an essential piece of gear for rescue and law enforcement professionals, as well as anyone who needs to throw a lot of light a great distance down range. A quick cycle switch allows you to select between a high output setting of 1,132 lumens, a high powered strobe mode, or a low output of 95 lumens. Using 4 D cell batteries, you will get a runtime of up to 4 hours 15 minutes on high or up to 192 hours on low. Built tough, an impact-resistant, lightweight aluminum casing resists rust and corrosion. The HP314 also features an unbreakable LED and rubberized O-ring for reliable water resistance and durability. Backed by Coast's lifetime warranty against defects in materials and workmanship.